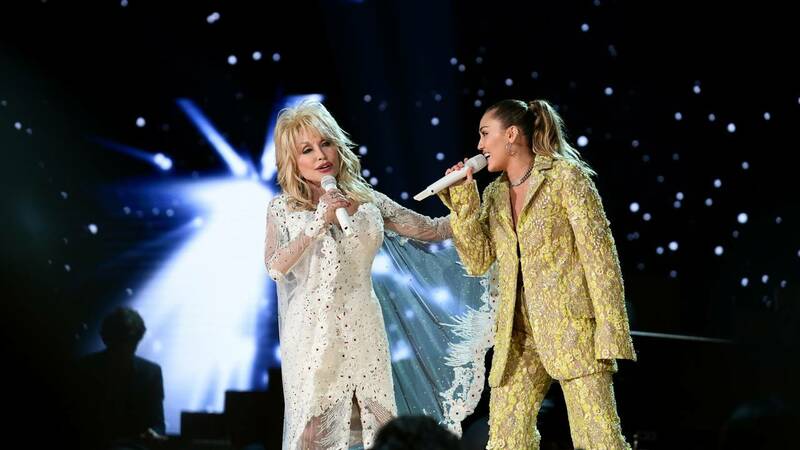 Dolly Parton (L) and Miley Cyrus perform during the 61st Annual GRAMMY Awards at Staples Center on February 10, 2019 in Los Angeles, California. Parton, an eight-time Grammy winner, was serenaded by her goddaughter, Miley Cyrus, Little Big Town, Katy Perry, Maren Morris and Kacey Musgraves. During the opening with Musgraves and Perry, Parton joined the duo to sing her hit, "Here You Come Again." Next up was a duet between Parton and Cyrus who sang her classic, "Jolene." The music legend then opted to sing "Red Shoes" from her 2018 album, "Dumplin'" -- she also just so happened to be wearing a pair of killer red stilettos. At the end of the moving tribute, the artists joined Parton to sing her hit "9 to 5," which was written for the 1980 film of the same name that starred Parton, Jane Fonda and Lily Tomlin. Cyrus teased the tribute in the days leading up to her performance with an Instagram post showing her with Shawn Mendes in matching leather jackets with Parton's face emblazoned on the back. "This could be the year for the real thing @recordingacademy @shawnmendes @dollyparton," Cyrus wrote alongside the photo. Parton, a native of Tennessee, won her first Grammy in 1978. Two of her songs, "Jolene" and "I Will Always Love You," have both been inducted into the Grammy Hall of Fame. Parton received the Recording Academy's "Lifetime Achievement Award" in 2011.